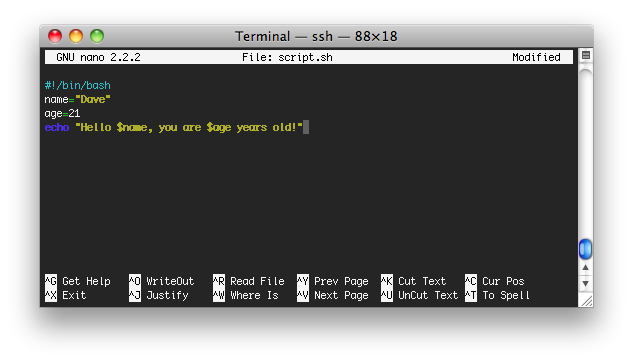 A script is a collection of commands saved in a file that can be called upon later. To write a script is very easy, and we will use nano to write one. Nano is a super light weight text editor that is easy to use and learn. To start off go to your home directory by typing cd ~ (bonus, you can also do cd "$HOME", or just cd by itself)! Now type this command. It used the variables and replaced them where they belonged in the echo statement. That was a basic script, we'll cover more advanced ones later. Note. Nano as an editor is pretty basic, for more advanced text editing you might want to consider an editor like vim.